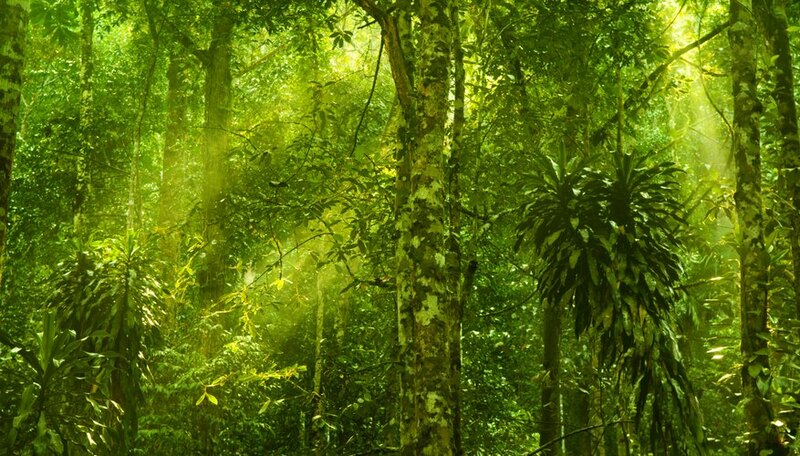 A rainforest is a tropical or temperate area of the globe that receives substantially more rainfall than other areas. Tropical rainforests are mostly found near the equator, while temperate rainforests appear in other latitudes closer to the poles. Climate, soil type, precipitation, temperature and sunlight are all abiotic factors that determine the composition of a rainforest, including the major differences between rainforests in tropical and temperate regions of the globe. Precipitation in a rainforest environment is substantial, ranging from 50 to 300 inches of rainfall per year. This incredible amount of moisture leads to many unique adaptations in plant species, since capturing nutrients before they get washed away by heavy rainfall is essential to survival. Many regions have a "wet season," in which monsoons or heavier rainfall become more common. In temperate rainforests, some precipitation falls as snow at higher elevations. Humidity in rainforests varies, on average, from 77 to 88 percent, allowing the growth of epiphytes or "air plants," which grow on surfaces like tree branches, without soil. Because nutrient uptake from soil is rapid, the soil in mature rainforests is often loose, sandy and devoid of nutrients. Trees use above-ground root systems to capture nutrients that filter downward in the form of decomposing organic matter before heavy rainfall can wash them away. This creates an incredibly nutrient-rich topsoil. Because the deeper soil in the rainforest is so heavily leached, large trees receive little nutritional support. This leads to adaptations like buttress roots, which extend up to 15 feet above the forest floor to provide support to large trees. Temperatures in rainforests vary by region. On average, temperatures rarely get higher than 34 degrees Celsius (93 degrees Fahrenheit), or lower than 20 degrees Celsius (68 degrees Fahrenheit). 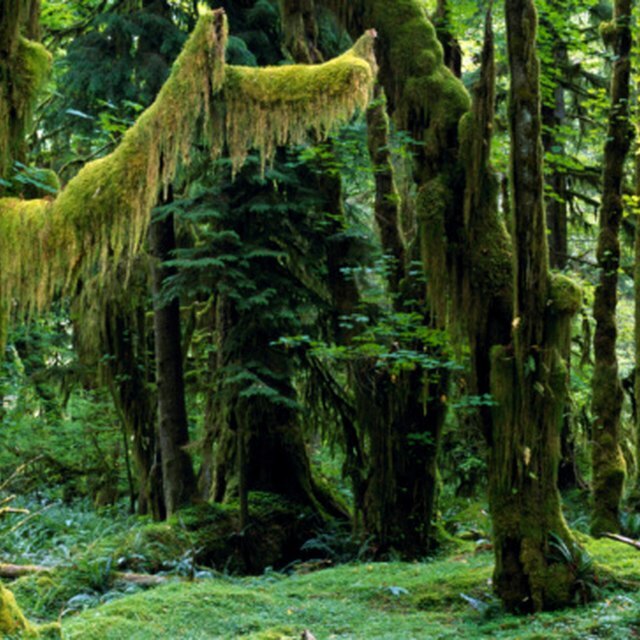 Temperate rainforests, however, can exist at substantially colder temperatures. Like their tropical cousins, these rainforests have heavy rainfall and similar soil profiles. Their biology, however, is completely unique, consisting of a mix of deciduous trees and evergreens accustomed to cooler temperatures. These temperate environments occur in the American Northwest and regions like New Zealand and Chile. The layers of vegetation in a rainforest can filter out all but 6 percent of the light from the sun before it reaches the forest floor, limiting the growth of any vegetation underneath the canopy. Some younger trees may languish in the shade for decades until a hole is created in the canopy by a fallen tree. When this occurs, growth is immediate and the canopy is restored in just a few years. Vines and lianas, or woody vines, often compete with trees for sunlight by climbing to the canopy along their trunks, occasionally strangling their hosts in the process by denying them the precious sunlight they need to photosynthesize. Roman, Max. "Abiotic Factors of a Rain Forest." Sciencing, https://sciencing.com/abiotic-factors-rain-forest-7826455.html. 10 March 2018.